I have come to the conclusion that pain patients tend to be feeling people, that they interpret the world through feelings. One may see a psychologist who will make the diagnosis of a somatization disorder or reaction, or anyone else who will say it is a psychosomatic problem, but this is generally not helpful at all. It carries the stigma of condemnation and is quite judgmental. Who are the judges? Who sets the standard? There is no such thing as a psychogenic pain, for to say so implies great ignorance on the part of the judgmental person speaking such words. For to say that something is only "in their head" or psychological is faulty judgment and ignorance 0f how pain is integrated, interpreted, and perceived by the body and mind. Anyway, back to the feeling person and their feeling brain. They understand what they perceive and what they feel. At times, it has a greater influence on behavior and beliefs than intellectual knowledge or the "LOGICAL". When I speak with my pain patients about this type of person, they invariably seem to understand exactly what I mean, although, I don't know for sure what they do understand. It may be pure semantics. Logical, brainy type people don't get it for the most part, and most doctors I know are logical, brainy type people. That is my reasoning for the diagnosis of somatization disorder. Most doctors do not understand what a feeling person and their highly developed feeling brain is, so it must be abnormal, a "DISORDER". If everyone had a feeling person's brain, then being logical and feeling-challenged would be a disorder. Anyway, I am still trying to understand this and have asked others, including psychologists, what this phenomena is without luck. I do not accept that it is a somatization thing at all. To me, it is a natural way of understanding the world, people, and life situations. 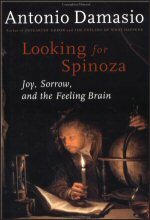 I was fortunate to see Dr. Anthony Damasio on a C-SPAN book program, and my search for answers has been renewed. It is as if the final piece has been put in place for me. My quest has always been to find ways to help pain patients understand pain and to get control of it. I am hopeful that this path will lead to a whole host of things that we can pursue for effective treatments and outcomes. The limbic model has always felt right to me because the limbic disorder model reproduces the actual pain patient's experience. It helps the patient to understand all the components of their chronic pain. It reinforces the need for interdisciplinary treatment, and the science behind it should change minds about how to best treat chronic pain patients. It may even force insurance companies to pay for these services and not fight the patient at every corner. I am hopeful that further research will lead to better multidisciplinary approaches to therapy. Dr. Damasio's work and model of emotions sets this in motion. This is very important for motivating patients to make the changes in their lives that will decrease the perception of pain and not put Mickey Mouse band aids on a life in turmoil from out of control pain. I am hopeful that it will drive home the message and need for deep effective "LIMBIC TRAINING and RECONDITIONING" for the "LIMBIC DYSHARMONY" brought on in the chronic pain patient. I am hopeful that it will lead to studies in "Brain Plasticity" and ways to rework the matrix, perhaps by hormonal rejuvenation (growth hormone, testosterone, etc), neurotransmitter manipulation, and other treatments which produce activation effects in the brain. These are treatments that I pursued and over time, I have made great advances in decreasing my pain. Other "activation effect" therapies do not have to be drugs or such, but therapies to stimulate or de-stimulate certain areas of the brain. The model of the feeling brain makes sense from a practical point of view and, hopefully, is one that will yield great benefits in understanding and controlling pain. More on getting yourself in the right place later. Below is presented in schematics the origin of pain. I do not have a name for it so I call it the Bio-Emoto-Neuro Matrix of an individual, Or BENM for short. Again, being the hands on surgical mind that I am, I remind you that I am looking at each level for things to change or modify that will reduce the experience of pain and improve the feeling of life. EMOTIONS AND FEELINGS GENERATED BY E.C.S. (EMOTIONALLY COMPETENT STIMULI). The BEN Matrix STATE of an individual changes with time and is, therefore, DYNAMIC. The performance of the BEN matrix can be modified by the person (The Mind or perhaps, it may be called the Matrix Will) and by other external forces. The BEN matrix STRUCTURE can be changed by activation. The Feeling of PAIN can be changed independent of the anatomical trigger or pain generator!! "FEELINGS (THE EXPERIENCE THEREOF) OF PAIN OR PLEASURE OR SOME QUALITY IN BETWEEN ARE THE BEDROCK OF OUR MINDS." "EMOTION AND RELATED REACTIONS ARE ALIGNED WITH THE BODY, FEELINGS WITH THE MIND." "THE EFFORT (INVESTIGATION OF HOW THOUGHTS TRIGGER EMOTIONS AND HOW BODILY EMOTIONS BECOME THE KIND OF THOUGHTS WE CALL FEELINGS) HAS MORE PRACTICAL PAYOFFS, HOWEVER. 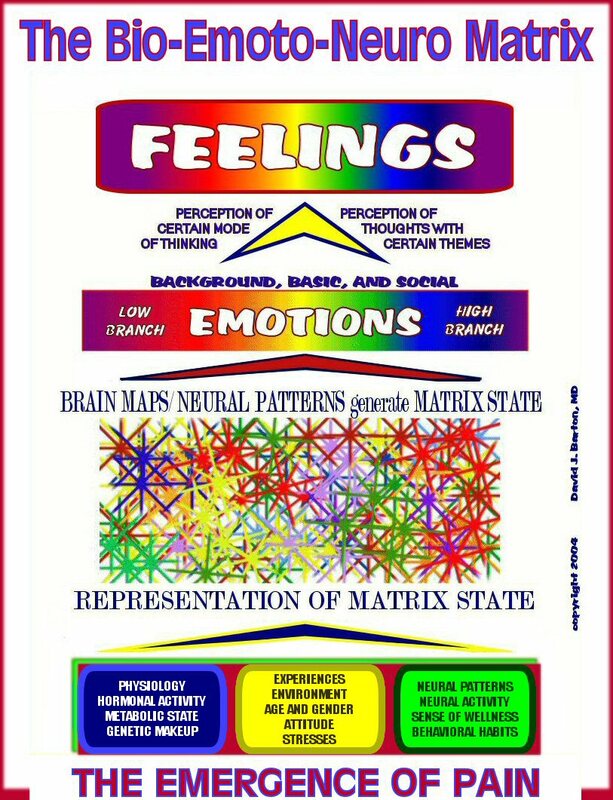 EXPLAINING THE BIOLOGY OF FEELINGS AND THEIR CLOSELY RELATED EMOTIONS IS LIKELY TO CONTRIBUTE TO THE EFFECTIVE TREATMENT OF SOME MAJOR CAUSES OF HUMAN SUFFERING, AMONG THEM DEPRESSION, PAIN, AND DRUG ADDICTION." "I am convinced that mental processes are grounded in the brain's mapping of the body, collections of neural patterns that portray responses to events that cause emotions and feelings."